all this and more in the first few weeks! Higher Fyah is proud to be bringing you reggae and dancehall in full strength- no dilution! This week featuring the fabulous musical fyah of Jamaican Bushadee spinning tunes in his DROP BASS SOUND style! 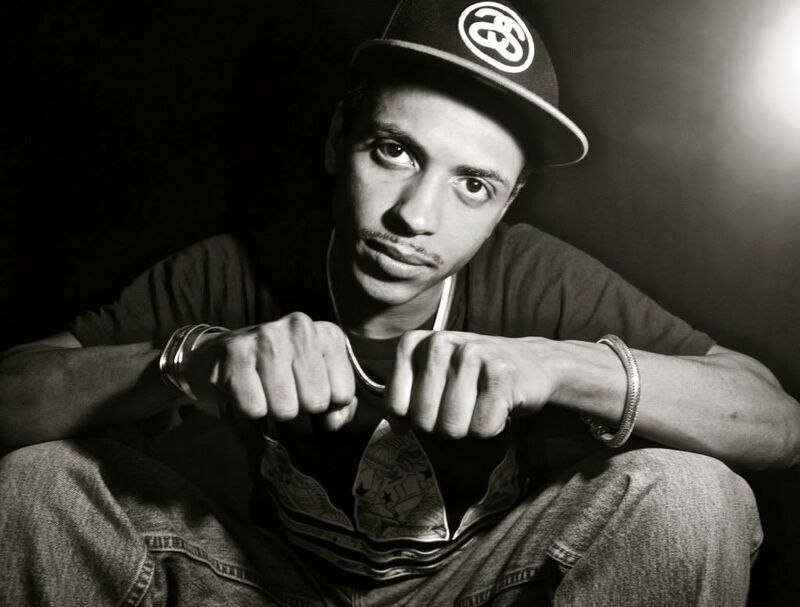 check this mans pattern on the decks and mic, you can also catch Perths own living legend - GENERAL JUSTICE, and DJ RAY outa Kenya! 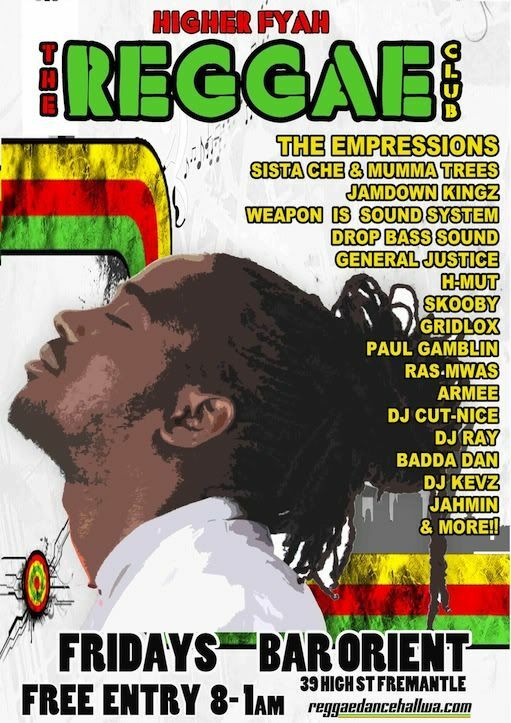 THE EMPRESSIONS will be forward in full effect - with a bill like this you know pure reggae niceness a gwaan! $7 pints (all tap beer!!!! including heinekin) from 6pm - 9pm! starting at 7PM and going through to 1AM!!!! And the entry fee for this master showcase of reggae and dancehall??? TOTALLY, 100%, ......FREE!!!! oh yeah - forgot to say - $7 ALL PINTS from 6pm - 9pm!!!! 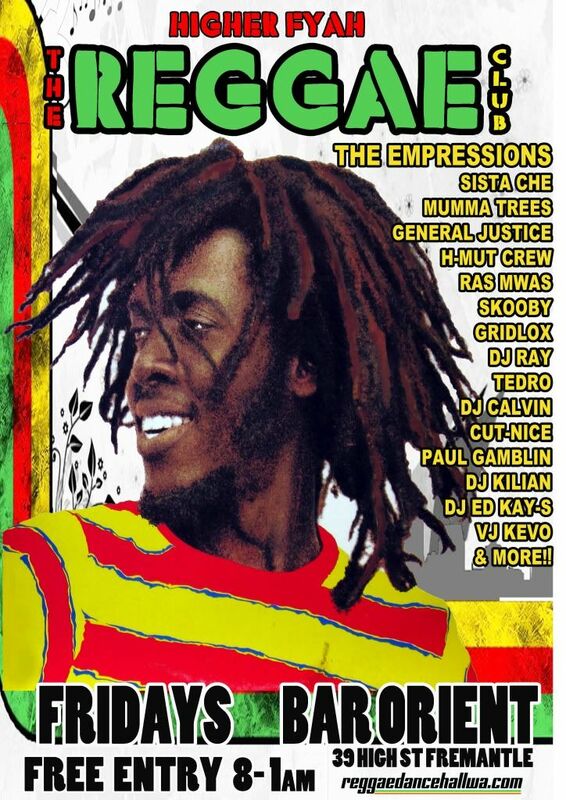 This week Higher Fyah is celebrating our cultural diversity through the medium of REGGAE MUSIC!!! prioritizing respect, fairness and a sense of belonging for everyone!!! Reggae music is a music of peace and love and harmony and reggae events are an arena for that to be lived in real time ....one thing that always gets a mention at our events from new comers is that the crowd is so multicultural. Rastafari advocated for world citizenship in the speech put to music by Bob Marley (War). be a true world citizen and get on the dance floor!!!! Keeping it in true Free-o style... that's right, its FREE ENTRY! So come down and be part of Fremantle's One Love Family - EVERY FRIDAY, BAR ORIENT, 8PM -1AM, FREE ENTRY! Just got home from Fremantle. Some guy was pulling the posters out of the windows of his record store. God he was rude when i told him to keep them up. Glad his Boss was there and told him wats wat. He looked like he just listens to rap music anyway. Looks like a great way to start my Easter Weekend, c u there! 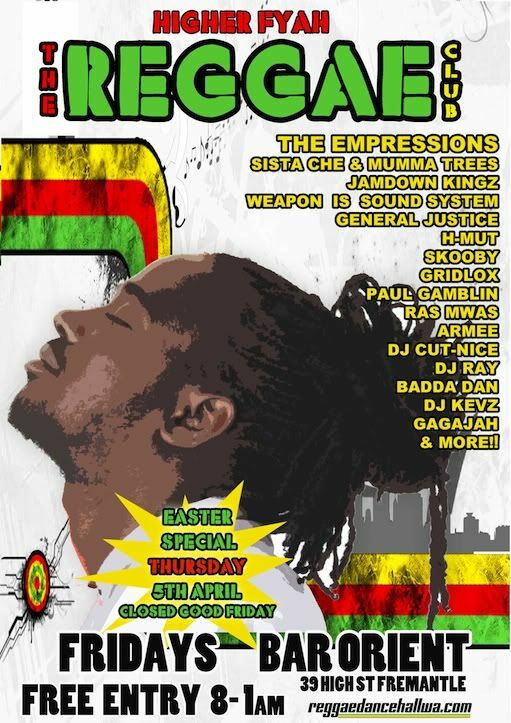 As everything is closed on Good Friday, Hihger Fyah will be running on Easter Thursday this week! With 2 rooms of reggae, dub and dancehall!!! 8pm - 12am Free Entry! Special events and international guests coming up in May! Watch this space!!! Born on Feb 6th in 1945, Bob Marley would have turned 65 this year. Bob flew away home to Zion when he was at the tender age of 36 on the 11th May 1981. He had only been a recording artist for under twenty years from his very first recording 'Judge not' and 'One cup of Coffee' recorded in 1962, to being signed to a major label in the early seventies and he released catch a fire 1972 and burning in 1973. From 1975 to 1980 Bob Marley put out a studio album every year, and several live albums. His political and spiritual ideals in his music have captured generation after generation and his music lives on way beyond his passing in 1981, his legend truly lives on and on. From the tiny island of Jamaica, Bob Marley brought Reggae and all its associated styles to the world. Spend a night with Perth's top ranking Reggae and dancehall sound system and D.J.s to celebrate this mans great life and music. General Justice from Jah Wisdom Sound. General Justice is the originator of RTR FM's 'JAMDOWN VERSHUN' Reggae Radio show airing in Perth for over 30 yrs! Come see him weave his magic live! The Empressions, Australia's first ladies of Dancehall, Mumma Trees and Sista Che who have recently played support for Jamaican touring reggae artists such as Gyptian, Anthony B and Cecile among others. they have alot of love for Bob Marley music and the whole development of Jamaican reggae music. H-Mut a Zimbabwean duo dj team, will show you how much they love Bob Marley down in the south of Africa! Lastly but not least RAS Mwas originally from Kenya, will show how much they love Bob Marley in the north of Africa! Bar orient, Higher fyah -The Reggae Club. Greetings lovely reggae fans! Hope everyone is well and surviving this cold weather! One sure way to warm up this winter is at higher Fyah - THE REGGAE CLUB! 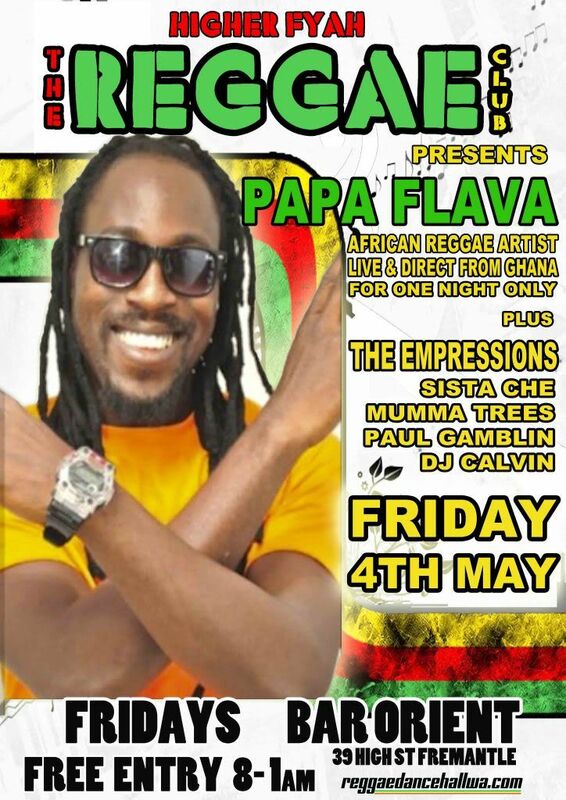 Kick off your weekend this Friday at THE REGGAE CLUB HIGHER FYAH. With mad skilled DJ'S CUTNICE playing some Kenyan dancehall, DJ ED O 'S' KAY also repping from Kenya! GENERAL JUSTICE keeping it real with reggae. 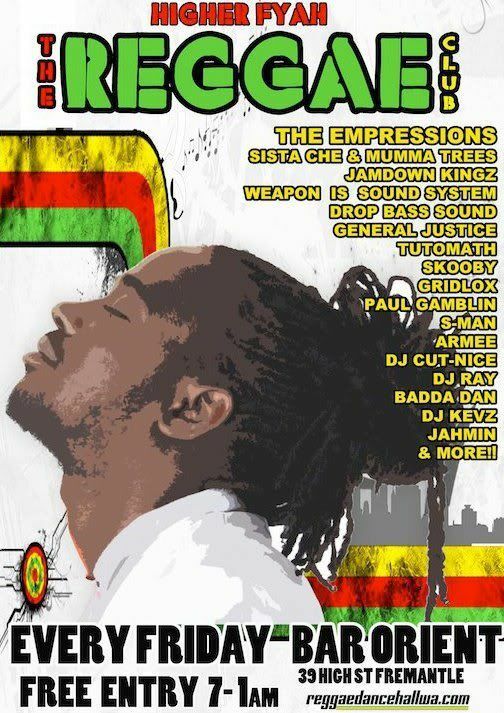 MUMMA TREES AND SISTA CHE, THE EMPRESSIONS blazing both reggae and dancehall. ***some super special events coming up soon at The Reggae Club - to be the first to know, be a regular at the club!!! **** Seriously big and groundbreaking events!!! Details out soon! some BIG TINGS coming up this month .. details out soon! This Friday @ Higher Fyah - The Reggae Club you can win double passes to see the new Marley Movie at Luna Cinemas (Leederville or Fremantle), plus tunes by H-Mut Crew and Cutnice, and The Empressions ... 8pm - 1am, free entry, nice price drinks - super cheap before 9pm! 'THE MARLEY MOVIE' FIRST SCREENING AFTER PARTY! COME IN AND ENJOY A DANCE AND A DRINK WITH MANY MARLEY FANS! SHOW YOUR MOVIE TIX AND RECEIVE YOUR FIRST DRINK FREE! Dj's providing you reggae sound scape will be DJ RAY (KENYA), RAS MWAS (KENYA), GENERAL JUSTICE, THE EMPRESSIONS, MUMMA TREES AND SISTA CHE! 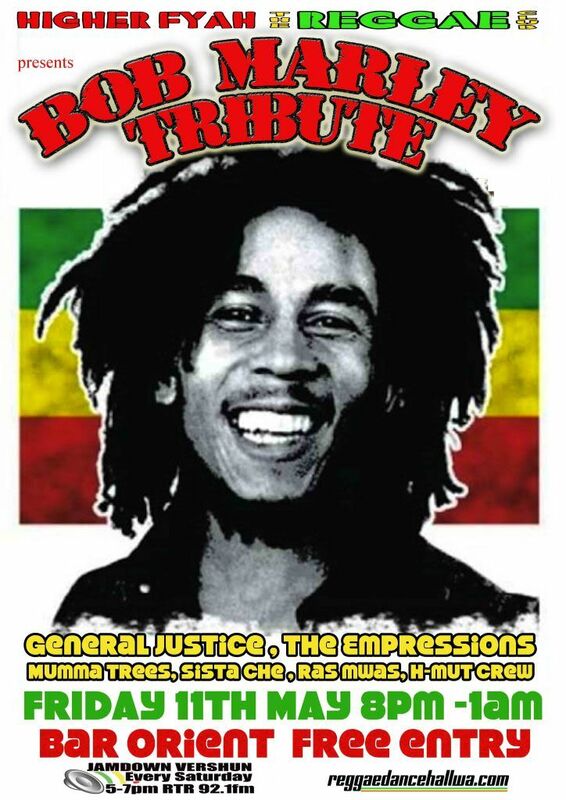 Expect Marley on heavy rotation mixed with reggae classics and a touch of brand new reggae otta' Jamaica! Blessings and Big ups go out to Luna cinemas! From Academy Award-winning director Kevin Macdonald (One Day In September, The Last King of Scotland) comes the story of a towering figure of musical history, whose music and message has transcended different cultures, languages and creeds to resonate around the world today as powerfully as when he was alive. Tickets at normal cinema prices. Film Starts 8.00pm. Now on sale and online. 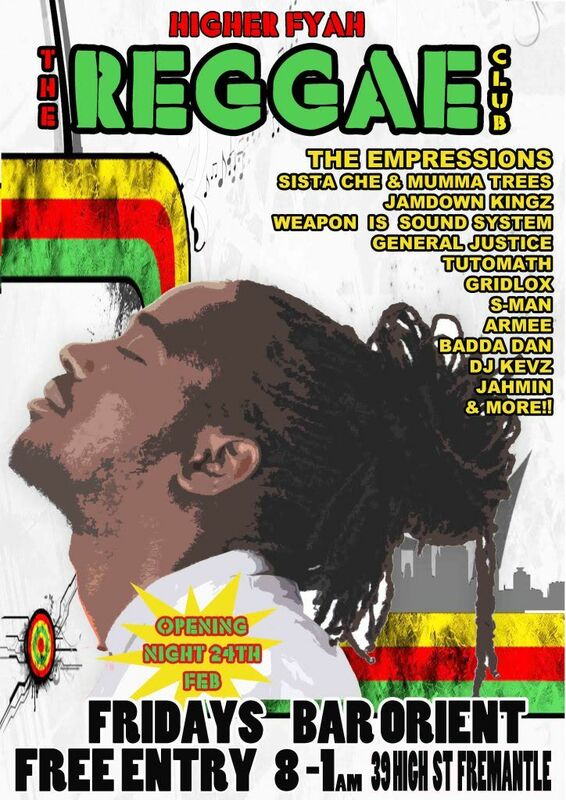 Luna on SX Friday June 22 Post Screening Celebration at the Higher Fyah the Reggae Club at Bar Orient following the 6.30pm session. This Friday 29th June - Higher Fyah the Reggae Club will be celebrating International Reggae Day a likkle early - with special guest DJ's Jahmin (NZ), Skooby, and from Sydneys Jamrock reggae club - Nick Toth! ITALIAN GUEST SELECTOR IN THE AREA! EXCLUSIVE DJ SET BY SUPER BROS!! This week at Higher Fyah the Reggae Club we have another Big line up for you! Reggae gone International that's what they say...TEDRO originally from the States and has a massive vinyl selection will warming up on the wheels of steel! In Fact its all about the vinyl collectors this week! GENERAL JUSTICE originally a U.K. lad, but now Western Australia original Sound system Lion, 30 years deep and still ruling! will be dere on the decks doing what he does best! For the first time in Australia all the way from Italy - SUPER BROS, singer and DJ will be throwing down his selection in an exclusive dj set! Being Italian is all about the passion, SUPER BROS aka Mario Tortorella, is super passionate about djing and singing. In 2004 SUPER BROS passion for djing ignited! He weeded through a few genre's till as a Rasta soljah he believed his true calling was reggae and its many shades...ska, roots, 90's ragga, modern dancehall. Once he got a good command of the turntables and a nice collection of 45's (including quality influences like Tenor Saw, Skatalites and Jacob Miller just to name a few), he clubbed up with his team to form THE MAMBASSA FAMILY. This family of many coloured brothers continue the fight against racism in Italy with the power of music. 2005 time to shine, Super Bros picked up the mic to chat over Jamaican riddims and has been hooked ever since. Super Bros has released several original tunes including Strike and 2010. He also has several collaborations with other Italian Artists such as Santo Man. In the words of Super Bros, music is my life! Wish you there? Me too! So we gonna have our own sumfest party this friday night! 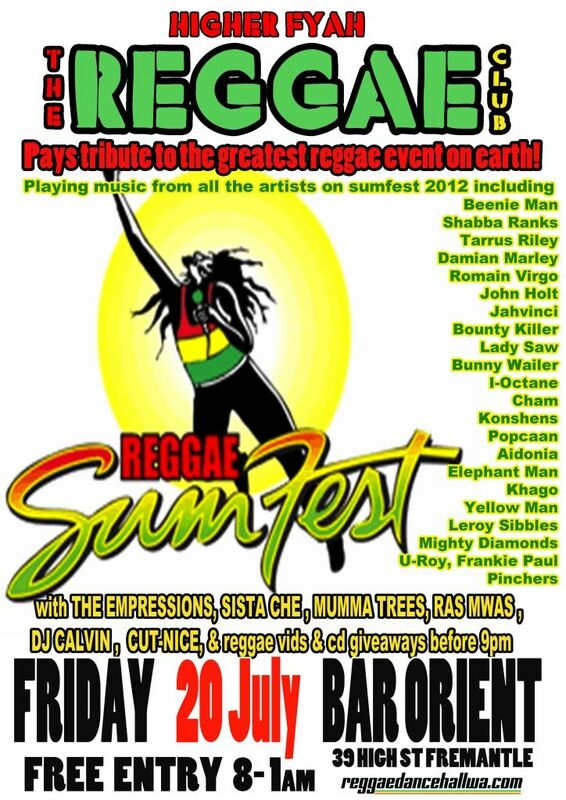 Playing tunes from all the great artists on sumfest 2012, we gonna have reggae vids on the screen and cd giveaways before 9pm! Nice price drinks to get you in the dancing mood and madd selectas on tha decks - the Kenyan kings - Ras mwas, Calvin and Cut-nice! And the Empressions will be deyah keepin it real as always lol see you there! This Friday!